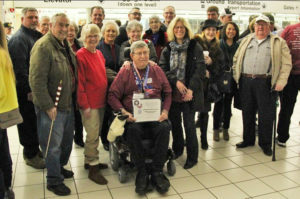 A member of the Enterprise Grange was honored at the first Greater St. Louis Honor Flight to Washington DC on March 2. Brother Norman Keller was not able to attend the actual trip, however, those not able to go on the flight were also honored at the airport when the others on the flight returned to the airport. Rather than having a Grange meeting, the members of Enterpise Grange #1929, went to be with him and greet the others being honored.